While president-elect Trump believes himself to be a BSD, the real commander in chief of humanity resides at The Marriner S. Eccles Building. One year after the first historic Federal Funds hike, Grandma Yellen will raise again. 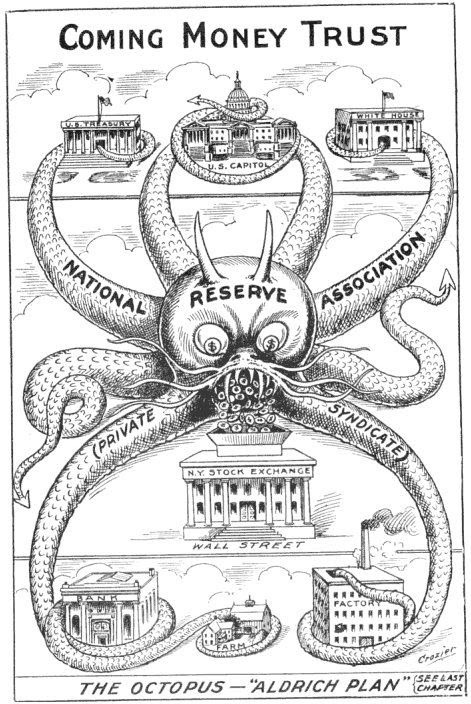 The US Dollar is the king of all fiat currencies. Regardless of how many commentators warn of the impending doom for the USD, it is and will remain for some time, the global funding currency. Equities, commodities, and debt are all priced in some way off of the USD. Trump’s inflationary intended fiscal policies are the cover Yellen needs to continue rate normalisation. Luckily for Yellen, the hubris of equity investors globally remains. They pay no heed to the future higher cost of funds; they believe the free money party will last forever. Even in the face of a steadily depreciating Chinese Yuan, the S&P 500 and Dow Jones continue to hit new highs. As always, the real concern is China. Leading up to the Fed meeting Wednesday December 14th, the PBOC has steadily sliced the Yuan. Usually this creates panic in global markets; however, Trump stopped all that. The Make America Great Again president-elect will go on a debt binge that his Republican compatriots in charge of Congress fully support. The market cannot get enough of the government spending more of other people’s money it doesn’t have. Look at how China’s fiscal spending levitated global markets in the wake of the Global Financial Crisis of 2008. China’s inability to spook Yellen meant that it went into overdrive closing the most egregious capital flight thoroughfares. Chinese companies completing offshore M&A deals must now receive approval. Shady Chinese insurance companies will think twice before buying hotel chains. Chinese who make the Haj to Macau will face more scrutiny. Macau may require pilgrims to declare cash in excess of $15,000. Macau gaming stocks got hammered in Hong Kong when that announcement surfaced on December 2nd. [Bloomberg] China could choose to raise domestic interest rates to make holding CNY more attractive. However, corporate and local governments would be forced to pay higher costs to roll over debt. And more importantly, financing rates for property companies and punters would skyrocket, collapsing the one asset class performing well in China. Desperate comrades stung from the 2015 stock market collapse, and unable to afford or purchase additional properties, then turned to the commodities market. Speculators flooded the futures exchanges causing sharp rises in industrial commodities. Beijing shut that down as well. Exchanges were instructed to raise margin requirements and fees to deter speculators. It worked. Volumes and prices crashed across the board. A recent Quartz article highlighted the plight of retail speculators. They interviewed several punters who have recently started trading Bitcoin. They like the 24/7 markets and high volatility. Some grasp the technological and economic genius of Bitcoin, but most just want a new, volatile, and non-governmentally controlled asset to punt. During the recent Bitcoin rally, the China Bitcoin premium rose to 4.50%. As the rally stalls, the premium is contracting. The premium will continue to contract leading up to the Fed meeting. 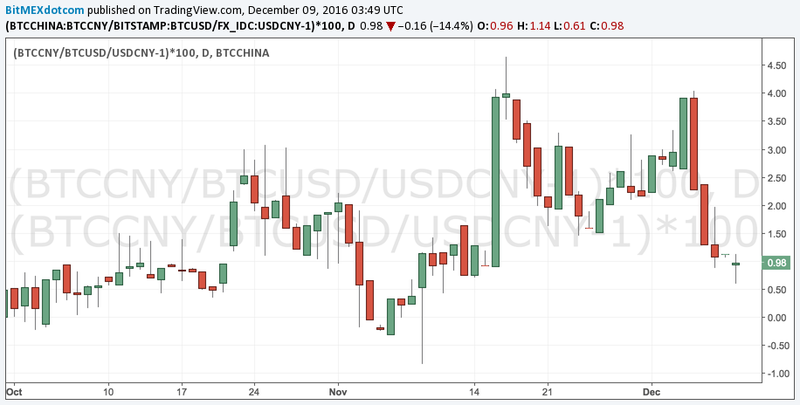 This week, BitMEX launched a 100x leveraged Bitcoin / CNY futures contract, XBCZ16. Combining XBCZ16 and XBTZ16 (Bitcoin / USD underlying), traders can directly trade the premium without Bitcoin price risk. Go long XBTZ16 vs. short XBCZ16 between now and the Fed meeting December 14th. If the Fed raises rates as most expect, reverse the trade, go long the premium by shorting XBTZ16 vs. going long XBCZ16. The trade thesis is that the PBOC will devalue the CNY to 7.00 against the USD. This will lead to an aggressive premium expansion.